CFL (Compact fluorescent lamp) , why should we use them? GE (General Electric), provided some basic information on why we must replace our current incandescent light bulbs with CFLs (or other lighting types - i'll discuss later). CFLs produce less heat and have a longer life than standard incandescent bulbs. CFLs have come a long way unlike the first models, modern CFLs don't produce flickering, humming or dim light when initially turned on. While most Filipino uses the ordinary CFLs bulbs (pictured below) which is suited for everyday lighting, there are other bulb types or design that suits our needs. Common varieties are floodlights, decorative, ceiling fans, globes, corkscrew-shaped and even outdoor post lights. 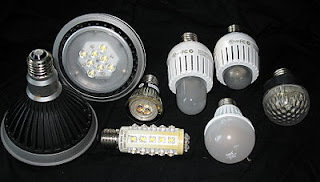 Another option being provided by light bulb manufacturers is the glass covered CFL, which basically is a CFL covered in glass to give the look of the traditional incandescent bulb. 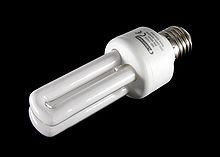 The average rated life of a CFL is between 8 and 15 times that of incandescents. CFLs typically have a rated lifespan of between 6,000 and 15,000 hours, whereas incandescent lamps are usually manufactured to have a lifespan of 750 hours or 1,000 hours. The life of a CFL is significantly shorter if it is turned on and off frequently. The US Energy Star program suggests that fluorescent lamps be left on when leaving a room for less than 15 minutes to mitigate this problem. CFLs uses up to 70% lesser energy to provide the same amount of lighting with incandescent bulb. Also , incandescent bulb produces light by heat while CFL uses another method. Replacing incandescent bulbs with CFL also reduces the heat inside rooms using lights most of the time such as living room. "According to the American Council for an Energy-Efficient Economy, lighting eats up 20% of the average household energy bill." Cost , CFL cost more than incandescent bulbs by almost 3-8x the price but is offset by the lifespan and electric bill savings. Dimming, one major advantage of incandescent bulb is dimming of light output which is possible by reducing the amount of electricity being feed to the bulb. For CFLs only few products have dimming capabilities. Color temperature, incandescent gives more natural lighting color so CFLs might not work yet for meticulous artists. LEDs and halogen lighting are the two other options but currently, they cost too much for consumer to justify cost effectivity. LEDs are far more better than CFLs but as I said before, the upfront cost could not justify the electric savings just yet. Most LEDs implementation are done on corporations,governments offices , infrastructure that has large electric bill. Changing to LED lights are feasible for them.